Titanic 107th Anniversary of her Sinking. RMS Titanic sank in the early morning of 15 April 1912 in the North Atlantic Ocean, four days into the ship's maiden voyage from Southampton to New York City. Last photograph of the Titanic: The article’s supporting photo is of the Titanic departing Queenstown (Cobh), Ireland, today 1912 — never to be seen afloat again. 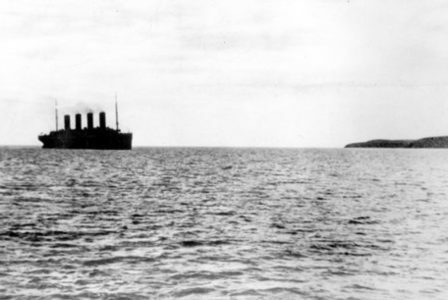 Titanic had an estimated 2,224 people on board when she struck an iceberg at around 23:40 (ship's time)[a] on Sunday, 14 April 1912. Her sinking two hours and forty minutes later at 02:20 (ship's time; 05:18 GMT) on Monday, 15 April, resulted in the deaths of more than 1,500 people, making it one of history's deadliest marine disasters during peacetime.